Bill T. came to see me with a severe intolerance to gluten that presented as skin blisters. This blistering was itchy and covered his arms, knees, buttocks and even some on his head. His doctor told him there was nothing that could be done besides managing with diet and prescribed creams. But Bill was so drastically sensitive that even cross contamination caused problems; making it almost impossible to enjoy a night out at a restaurant, snacks at the golf course and family meals. He even had to bring his own meals to weddings and ask the caterers to heat it up for him! Even after all this care and avoidance, Bill still had the rash. It was better but certainly not gone. During my first appointment with Bill we tested a generic vial of wheat and gluten. Then we isolated it further by testing 30 separate wheat proteins as well as enzymes that break wheat down in the gut. We also worked with 30 vials of the immune system and 30 digestive enzymes. After the first visit, Bill was much better. The rash was not gone but it was better than before and the flare ups were less frequent. I had asked him to keep a food journal detailing what he had to eat over the next two weeks and which days the symptoms seemed to be worse. This would help to isolate whether there were any other food triggers. I suspected there were more offending foods and possibly a cluster allergy. A cluster allergy is a reaction to a combination of 2+ ingredients. For example, you may test fine to egg and fine to mushroom but when you eat egg and mushroom TOGETHER, there is a reaction. 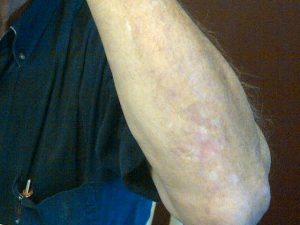 Since there are countless possible combinations of foods, I asked Bill to bring samples of foods he was eating on the days he noticed his skin flare up. Bill came for a few more appointments and brought his wife. They were both literally carrying grocery store bins full of food samples. It sounds excessive but this was the fastest way to pin down the cluster allergies in the shortest amount of time. Bill was convinced his lingering flare ups were still due to cross contamination with wheat; because his doctor had told him that wheat was the only trigger. In the second appointment we retested all vials of wheat and they were negative. Wheat was no longer responsible for these reactions. We tested all of the food samples that he had brought and put the positive testing ones on the machine to balance. We repeated this process for the next couple appointments while his skin continued to improve. Besides wheat, we will unfortunately never know exactly what ingredients he was intolerant to; because we cleared several products with long ingredients lists. But that didn’t matter to Bill. 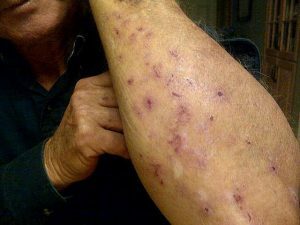 His skin reaction was completely gone and he was able to eat wheat and whatever else he wanted without any symptoms. Check out his testimonial below along with his before and after pictures! If you have experienced a gluten intolerance and are looking for a solution, contact me today to book an appointment.